BROSSARD – It’s never easy when a teammate leaves the fold, but the Canadiens must now move on without Rene Bourque in the picture. After the Lac La Biche, AB native cleared waivers at Noon EST on Monday, the Habs assigned the 32-year-old forward to the Hamilton Bulldogs of the American Hockey League. Bourque, who has been a member of the Canadiens since January 2012 when he was acquired in a trade with the Calgary Flames, struggled through 13 games this season, registering just two assists, while posting a team-low minus-9 differential. He hadn’t seen game action since November 4th against the Blackhawks, as he was a healthy scratch for the last two games following a less than stellar start to the 2014-15 campaign. That was the consensus inside the Canadiens’ locker room on Monday afternoon as players reacted to the news that the 10-year NHL veteran was on the move. 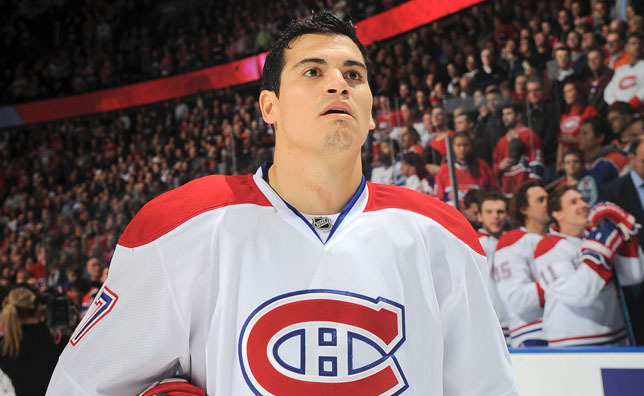 For his part, head coach Michel Therrien insisted that the decision to assign Bourque to the AHL was a result of poor production alone. It certainly wasn’t the way the Canadiens were hoping things would ultimately play out with the University of Wisconsin grad, who was a force to be reckoned with during the postseason last spring, leading the team with eight playoff goals. The loss of Bourque, however, is very much Jiri Sekac’s gain. After watching seven straight games from the press box, the talented young gun put on a show in his second game back on Saturday night against Minnesota, which may have ultimately sealed Bourque’s fate in La Belle Province. So does the Czech forward, who is still adapting to the realities of NHL life, some of which aren’t always that pleasant to deal with.